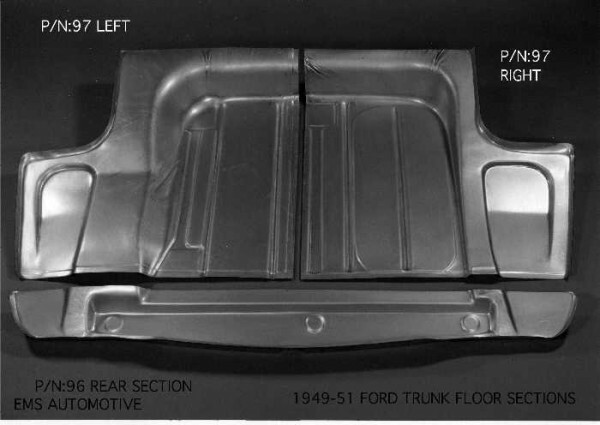 THE MAIN SECTION OF THE TRUNK FLOOR FITS FROM THE REAR SECTION OF THE TRUNK FLOOR (P/N:96) AND GOES FORWARD TO THE AREA JUST OVER THE REAR AXLE. EXTENDS COMPLETELY FROM SIDE TO SIDE. DUE TO THE SIZE OF THE TRUNK FLOOR IT IS SOLD IN A LEFT AND RIGHT SECTIONS, PLEASE SPECIFY. DIE FORMED 18 GAGE STEEL, USA MADE.